Bespoke floral & event design. I currently offer bespoke floral and event design services. 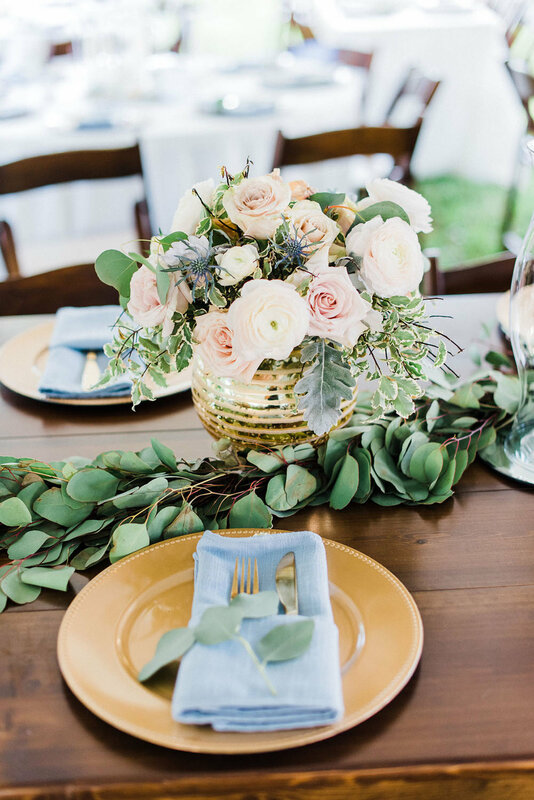 Event design is reserved for couples who have previously booked me for floral design services, so as to provide them with the most comprehensive, one-of-a-kind experience that truly reflects their love story. For this reason, event design services are limited to five couples per year. I personally source all vessels, ribbon, and special elements to make sure they play a proper role in your celebration. A selection of my roses, peonies, and seasonal items are grown on our sweet little farm, and the remainder are hand-selected by me, paying close attention to color palette and style. I spend time gathering information from you and your fiancé about your hobbies, how you met, and anything you feel is important to you. I work hard to turn these anecdotes into tangible, visually appealing elements throughout your design. My goal is to create a wedding day that is warm, inviting, and a place where your guests’ can feel your presence everywhere they turn. I am so grateful you are considering us for your vendor team. Selecting vendors for one of the most important days of your life can seem daunting. I would love to learn more about your ideas and love story.